the Gearhart Hotel & Sandtrap Pub. this historical spot reopened as Hotel Oregon. airports in the U.S. is now home to Cedar Hills Pub. and stands today as McMenamins' Fulton Pub. before debuting in 1987 as the Mission Theater. My inspiration for this panel was Grace Connolly and her students at what is today's McMenamins Kennedy School in Portland, OR. She arrived at the school in 1917 and when she retired in 1959, she was one of the school's longest-serving teachers. 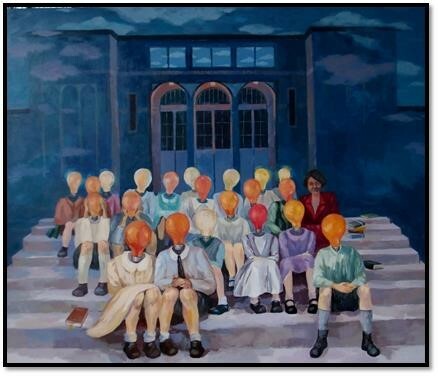 Knowing the importance of education, I used lightbulbs to portray the faces of the children, who with their bright and pure minds bring light into the world we live in. I do not differentiate between my feelings and the ways I transform them into my paintings. Moreover, paintings are constructed from my dreams, or memories from the past. Paintings appear from the depth of my being and different situations from life. I paint an objective reality in the way I experience it - a reality experienced with my being yet shown with my stroke of the brush on the canvas. Paintings with the headless people are there to ask questions: Do we know what we are doing, are we aware of our actions and the implications these actions will bring; does forgiveness still exist, or did we leave it only for the deities? Do we have right to suspect, or to accuse someone when we alone are not without the sin? To forgive and to advance, or to stay imprisoned in unforgiveness. 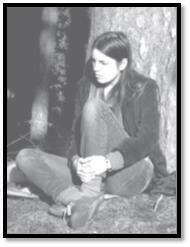 Do we then realize that we are stripped of ability to understand worthiness? Do the borders of bad and good exist and where are they? Where are the lines, which can be reached, and those that are forbidden? In my paintings, man and nature are alike and painted with the same colors, although I believe man, with his actions, has estranged himself from nature. I come to the finished composition in which drawing is connected to the color, color with the form, and form with the composition. I was born in Shkoder, Albania, and earned a BFA degree from the Art Academy at Cetinje, Montenegro. I was awarded scholarships while in Montenegro and have exhibited my artwork at galleries in Kotor, Montenegro; Belgrade, Serbia; Shkoder, Albania and Portland, Oregon, where I live and work. Do you have a story to share about one of our properties? Or maybe you have a historic artifact, photo, videotape or document to show us? We’d love to talk with you about it. 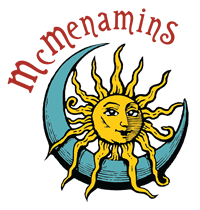 We are continually adding to our historical archives – who knows, maybe the information you share will be used in an upcoming project, in a piece of artwork by the McMenamins artists, as the topic for one of our history events. We want to hear from you. Leave some basic details and we will be in touch with you as soon as we are able. Image of old fashioned woman with camera on tripod. Image of old man with a pint glass of beer. Our best historical finds often come from you! Email us, fill out the form below, or give a call at (971) 202-7614 if you have a question or suggestion, or if you have photos, film, documents or artifacts you’d like to share.